HomeMade Modern’s cool DIY Concrete Planter with spigot. 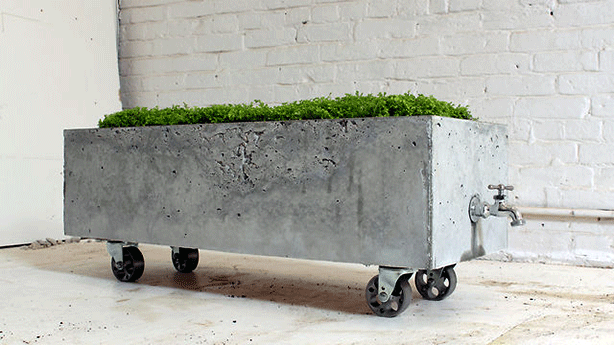 Concrete is the modern urban gardener’s muse. No surprise that for ages architects and designers alike have been drawn to concrete for its simplicity and range of textures. Indoor-outdoor concrete design options are endless. The material looks great raw, enriched with color, standing alone or in combination with other materials. 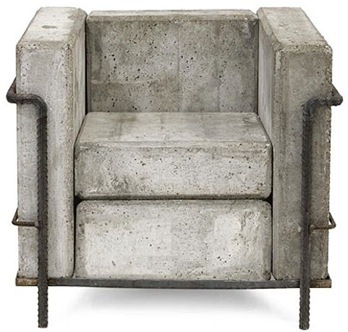 Concrete furniture and accessories bring an urban sensibility to any indoor or outdoor room. 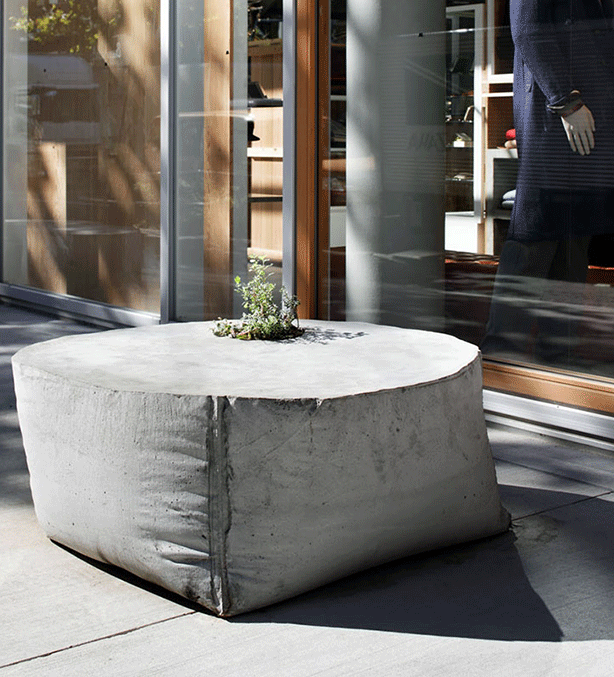 Concrete outdoor planter benches by Solso at Takeo Kikuchi’s Shibuya, Tokyo store. 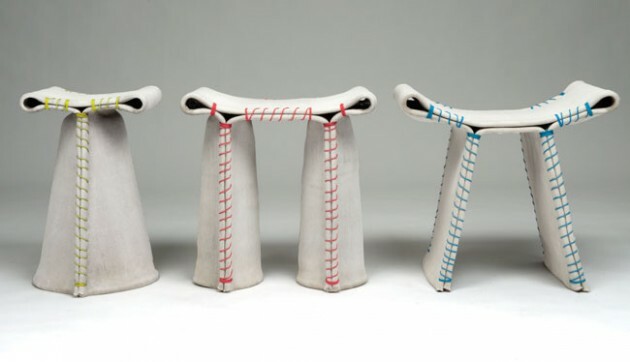 via Harshforms. Beyond the style factor, concrete is durable, weather and UV resistant, and it stays cool—making it perfect for outdoor furniture and accents. It’s also porous, so plants thrive in concrete planters. Then add to the mix the lightweight concretes–Thomas Edison’s idea from 1911–some of which use fiber reinforcements for a thinner material that doesn’t sacrifice strength, is easy to assemble, and often light enough that even a child can move it. And if that’s not enough, there’s translucent concrete that emits light. Believe it or not, these sizable and smooth stones, above, are lightweight. That means easy to carry to the rooftop where you can sit on or set your drink on them. Claps Stones are perfect for sleek urban spaces where multi-functional design and ease of transport are valuable assets. Available at 2Modern. 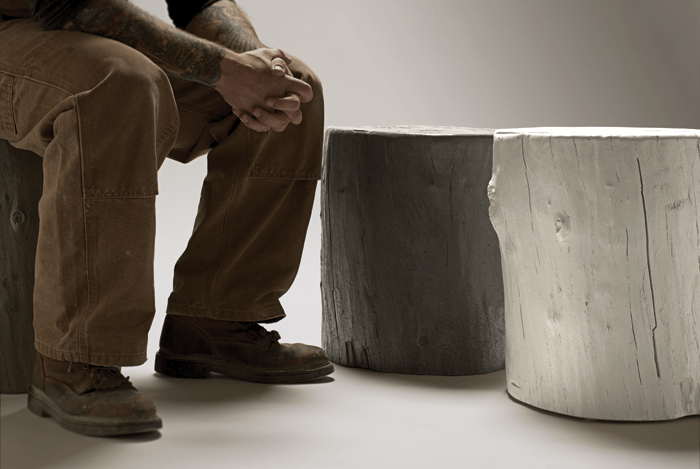 Using a real tree stump for a table or chair is a fun idea, but these hollow-cast concrete stumps add a modern twist. They are smart too–with the optional castors, Knotty Stool lovers can easily reposition the stools or even move them indoors. 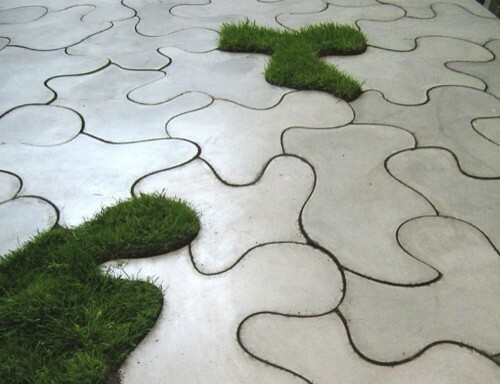 These chic and witty concrete slab puzzle tiles invite you to play on the patio. Let the games begin. Rainer Mutsch is one of my favorite designers and his durable outdoor pendant lamps set my heart aglow. I love that they hang from the same rope used for sailboats. 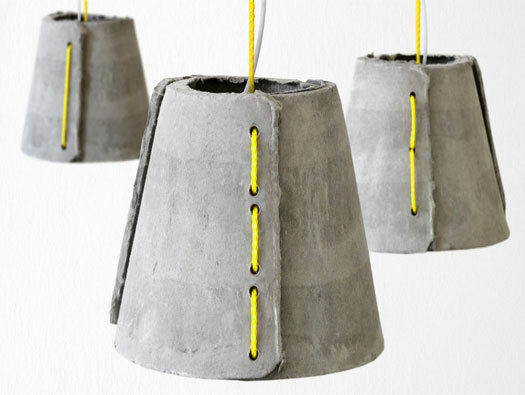 Crafted from hand-molded fiber-cement shells, they look equally amazing indoors. These lightweight cool stools stitch together the look of soft fabric with the strength of concrete. Created by folding cement-impregnated fabric supported with a PVC backing, they are weather and UV resistant, and fetching indoors or out. A concrete homage to the iconic Le Corbusier chair, designer Stefan Zwicky took a modern classic then outfitted it for the urban outdoors. Heavy duty design that isn’t easily moved, but whose look is very moving. The atmosphere of an outdoor fire burns urban with this fire pit made of a durable composite concrete. But I don’t just like it for its looks, it’s also intelligently designed. The fire sits 10 inches off of the ground, above vertical slots that allow drainage and let in air to feed the flames. 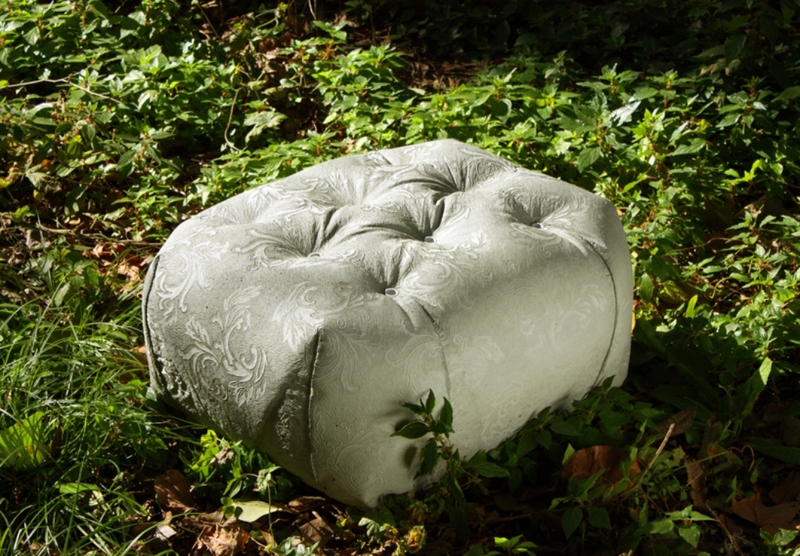 Playing with the texture of upholstery, this concrete pouf poses as soft furniture, creating fun outdoor or indoor seating. Hello, birdies. Here is a contemporary concrete and wood abode for our modern feathered friends. What do I love? 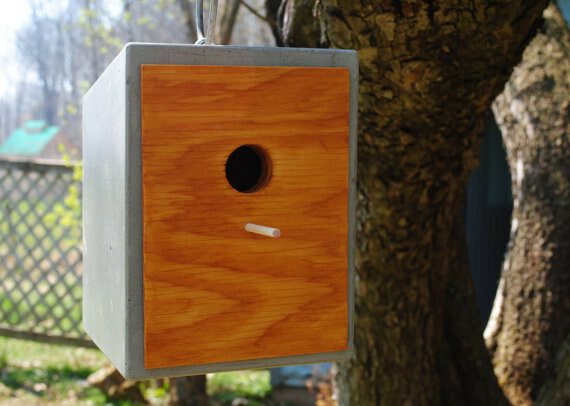 The magnetic lid be can easily removed for cleaning and the water-based acrylic sealer means you can leave the birdhouse outdoors all year-round. Take this modular concrete table anywhere you can plant it. 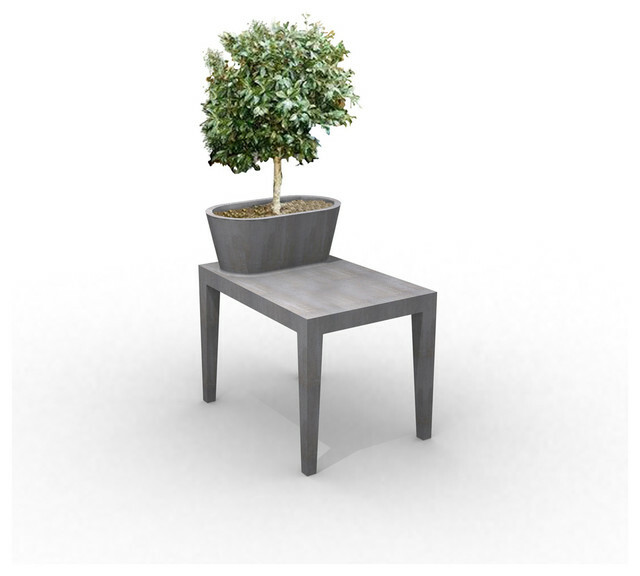 Part of a collection incorporating planters of varying sizes and configurations, this table enjoys a happy marriage with its seamless planter partner. Watch episode 16 of HomeMade-Modern.com where Ben shows how to make the concrete planter (top of post) using an old cabinet. Japanese landscape firm Solso created the outdoor planter benches (second photo, top of post) for the Takeo Kikuchi flagship store in Shibuya, Tokyo. Like these? Got a favorite? Head over to our Pinterest board for more concrete ideas!